Administrators of Portsmouth Football Club say they are yet to see proof of funds or clarification of finances from the Middle East consortium interested in buying the stricken League One side. On Tuesday former owner Sulaiman Al Fahim confirmed his involvement. But administrators PKF say they still require confirmation that the reputed £12.5m of funds are residing in the UK. The Portsmouth Supporters' Trust (PST) and former owner Balram Chainrai are both vying for control of the club. On Monday PKF said a Middle East consortium was also interested in the club and were "waiting for clarification on funding". 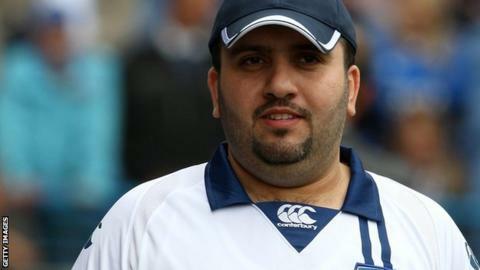 Al Fahim had a short-lived spell as owner of Portsmouth in 2009 before selling to Ali al Faraj but, despite confirming his involvement, the consortium have still not agreed to PKF's request to prove the funds are real. A report by the Dubai-based magazine Arabian Business said the potential Middle East investors had put $20.4m (£12.77m) into an account held by Dubai Bank on 30 August. Portsmouth have been in administration since February, following the collapse of parent company Convers Sports Initiatives. The PST and Chainrai's company, Portpin, have both had a Company Voluntary Arrangement of two pence in the pound agreed by unsecured creditors of the club, with administrator Trevor Birch currently assessing which bid is the best offer. Chainrai is owed £17m by the club and holds Fratton Park as security but the PST has offered him £2.75m to relinquish his hold on Pompey. Birch has set the pair a deadline of Friday, 14 September to finalise their bids. He had said that, as neither deal was close to completion, he was unable to decide which offer was in the best interests of creditors. Last month former Watford owner Laurence Bassini registered his interest in Portsmouth but he is not considered a serious option due to the advanced nature of talks with Chainrai and the PST, as well as the urgency with which a deal needs to be completed. It is thought that the same would apply to the Middle East consortium interested in Pompey. But if Birch is still not satisfied with the PST and Portpin bids he could pursue other options.